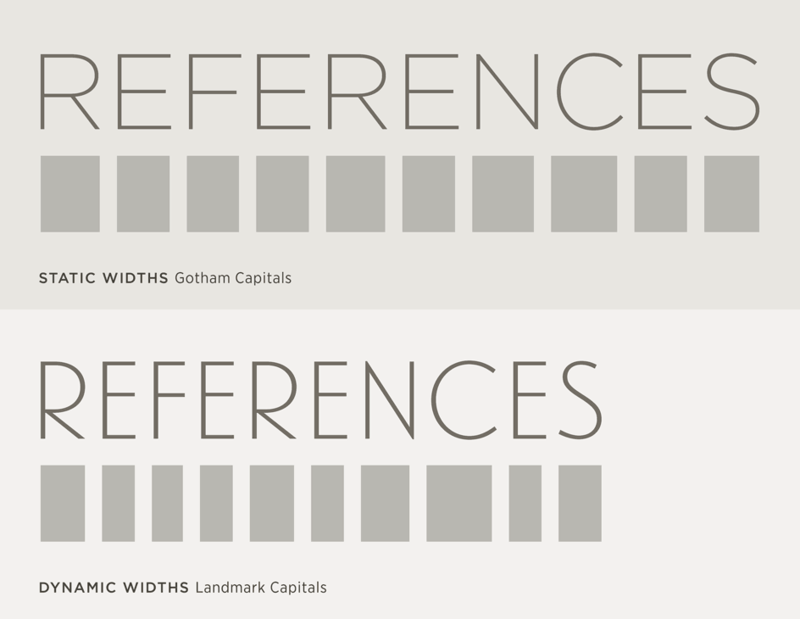 Landmark Font Features: Dynamic Capitals | Hoefler & Co. The caps that read like a lowercase. 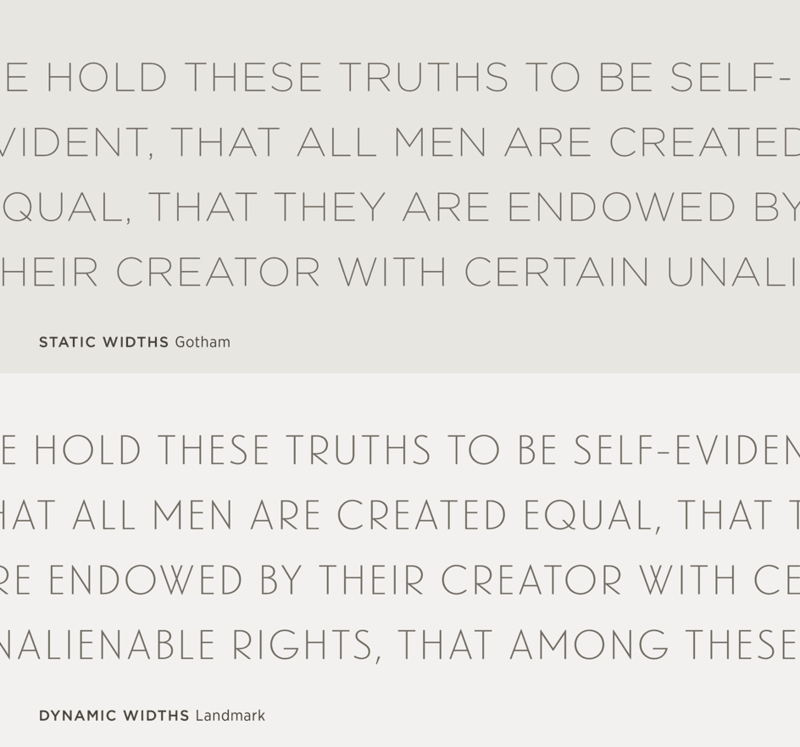 Landmark’s capitals are designed not to punctuate text, but to create vibrant textures that invite extended reading. Because most of the words we read are text, most of the letters we encounter are lowercase. Lowercase letters therefore bear the greatest burden in a typeface: not only must their forms must be distinctive and unambiguous, but they must create an energetic rhythm that both engages and sustains the reader. The principal way that lowercase letters produce a lively texture is by freely mixing characters of very different widths. Between the extremes of fully vertical characters (i, l) and especially wide ones (m, w), there are at least three different categories of proportions within the lowercase alphabet: upright letters (t, f, r), narrow ones (n, a, o), and wide ones (b, d, p, q). Together these ingredients create the varied and syncopated rhythm in text that attracts the eye, and rewards extended reading. Capital letters work differently. 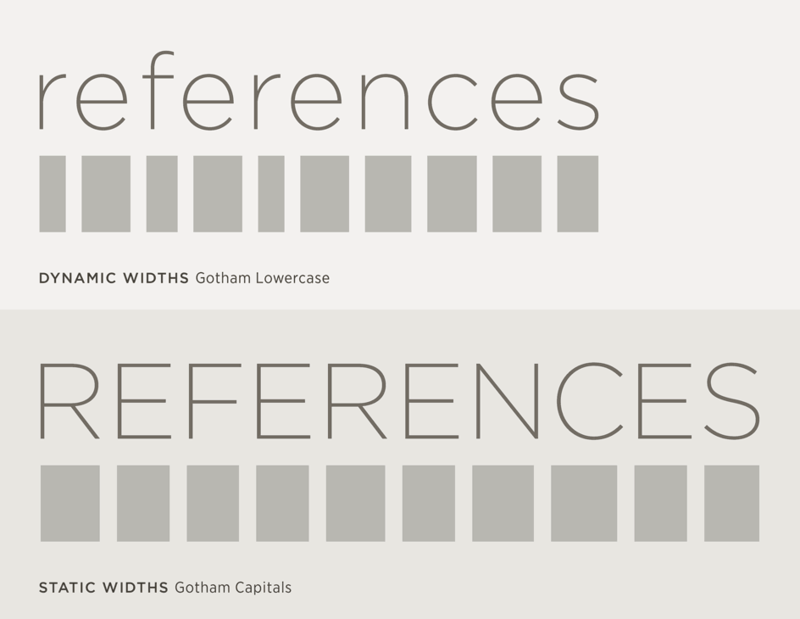 Because they must accompany lowercase letters of any proportion, capitals follow a much more strict program of widths. As a result, extended text using caps only can often have a monotonous and uninviting tone. Because it follows the architectural tradition and includes only capitals, Landmark required a strategy to ensure that extended texts are both attractive and welcoming. By heightening the difference between character widths — a technique borrowed from classical inscriptions — it achieves a vibrant tone and an animated rhythm.